When the reminder popped up on my computer that it had been 6 years that I start blogging about wine I couldn’t believe how fast time has gone. As I’ve mentioned in the past I started a wine blog to encourage myself to read, research and learn as much as I can due to my love and passion for Italy and wine, especially Italian wine. I will never claim myself as an expert as I’m far from it, but this is my own personal journey and I’m very thankful to my readers for joining me along for the ride. In trying to think about what wine I wanted to feature for such a special occasion it’s hard to just pick one bottle. There are wines that I brought back from my travels from Italy over the years that I’m aging in my basement. The question is what am I waiting for. Life is too short, but for special bottles I do like to take a moment to sit and savor the sips and with 2 little munchkins running around my house that’s not always the easiest to do. I decided to enjoy a 2008 Secretum Brunello di Montalcino DOCG that I must have brought back from Italy some years ago. I’m not sure why I had picked this particular bottle and if my memory serves me correct I was in a wine shop in Montalcino and chose this bottle to take home and try. Unfortunately, after countless efforts online I couldn’t dig up any information about the winery, which is what I love to tell most of to my readers. So why did I pick this particular wine? Well, I fight with the question of what is my favorite Italian grape and it’s impossible to pick just one. I always seem to lean towards sangiovese in its many styles whether it’s chianti classico, vino nobile di montepulciano, brunello di montalcino or from southern Tuscany in the Bolgheri wine region where it’s blended with international grapes. There are also great sangiovese wines from Emilia Romagna known as Sangiovese di Romagna that you don’t see too much of, but are definitely something to try. 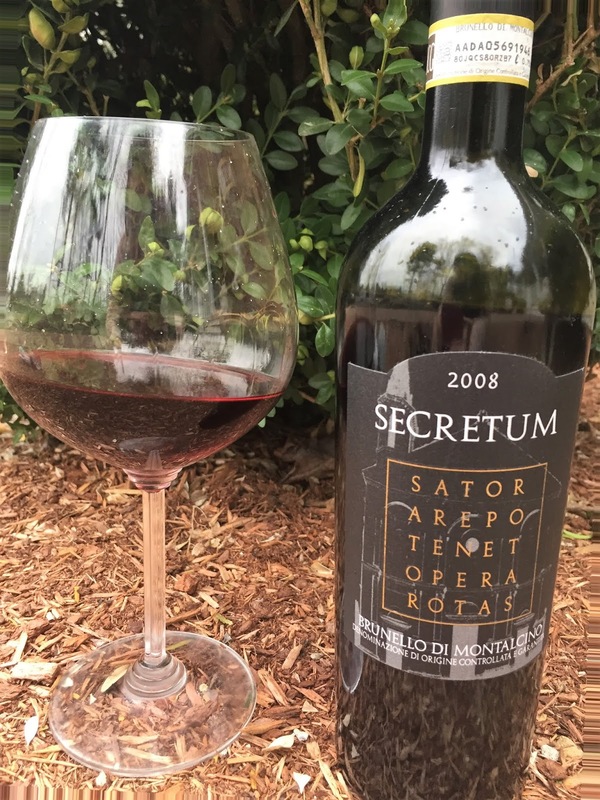 The 2008 Secretum Brunello di Montalcino DOCG was deep garnet in color with a hint of orange on the rim (typically comes with age). On the nose were beautiful ripe cherries, almost with a hint of cherry chapstick to it with some notes of licorice at the end. Classic sangiovese cherry notes on the palate with nice acidity and moderate to firm tannins. The wine needed a little time to open up as initially the tannins overpowered the fruit. A good lengthy finish with notes of vanilla at the end. Overall an enjoyable brunello with a smile on my face as I look back at how far I’ve come with a long road ahead. Please drop me notes or leave comments as I love to hear from my readers and it doesn’t happen all too often. I love all sorts of feedback and comments and for those that participated in my survey earlier this year I greatly appreciate the feedback so I can bring you more of what you’d like to read.